1996 marks not only the 50th anniversary of the death of the economist JOHN MAYNARD KEYNES, but also the 60th anniversary of the publication of his landmark volume the General Theory of Employment, Interest and Money. In this special feature, The Jobs Letter takes a look at Keynes and his nearly forgotten revolution, as well as essential summary of several tributes that have been published in recent months.
" 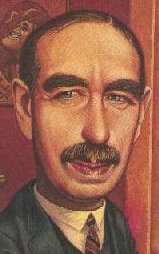 In 1936 the whole classical model of how the economy worked was challenged — one might say overthrown — by the publication of John Maynard Keynes's General Theory of Employment, Interest and Money. Once they had been absorbed, Keynes's theory and its implications dominated economic policy-making for a third of a century. It is a pity that it was not two thirds of a century..."
" Keynes did more than open up a more persuasive account of the dynamics of the capitalist economy than that offered by classical economists — he turned economics on its head. For his focus of attention was on how the economic system worked as a system. Rather than accept that the economic whole was the sum of its component markets, he insisted that the whole had properties and dynamics of its own — what biologists call 'emergent' properties..."
"The ideas of economists and political philosophers, both when they are right and when they are wrong, are more powerful than is commonly understood. Indeed, the world is ruled by little else. Practical men, who believe themselves to be quite exempt from any intellectual influences, are usually the slaves of some defunct economist. Madmen in authority, who hear voices in the air, are distilling their frenzy from some academic scribbler of a few years back... Sooner or later, it is ideas, not vested interests, which are dangerous for good or evil."